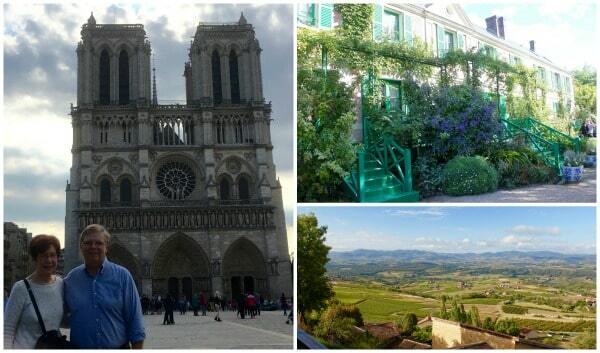 What Was Your Itinerary on this France Trip? Jeffrey: We did a 7-night European river cruise on the Rhone through Ama Waterways. We stopped at towns along the Rhone, including Lyon, Oingt (we called it “oink” — but that’s not how you pronounce it! ), Vienne, Tournon, Viviers, Grignan, Avignon, and Arles. Ama Waterways cruises also offered add-on nights in Paris and Barcelona. We decided to do the 3-day Ama Waterways add-on in Paris, but we stayed an additional 2 nights as well — for a total of five nights in Paris. Was this your first European river cruise? Kathleen: Yes, and we loved it. There were fewer people than an ocean cruise, so it wasn’t as crowded. And the food was out of this world! Ama Waterways cruises offered a five-course menu for lunch and dinner. And the wine flowed all the time. Jeffrey: Everyone was very friendly, and the cruise staff was excellent. A piece of my luggage handle broke off before we arrived at the ship, and I mentioned it to a staff member. She got an engineer to look at it and fix it for me! They just went out of their way to be accommodating. Was There any Destination that You Just Fell in Love with? Kathleen: We loved Lyon, and the little town of Oingt. It was so picturesque, just beautiful. Jeffrey: We arrived in Oingt on a Sunday morning, and it felt like no one was up yet. We had the whole town to ourselves. We also enjoyed Avignon, which is where 7 popes resided during the 1300s. Getting to see that was pretty amazing. Avignon is a walled city, and all the scenery is excellent — we were taking photos of everything. Any Destinations You Felt You Could Have Skipped Over? Jeffrey: We were not crazy about Arles. When you go on a river cruise, usually have to walk up a hill to get to town, and you see all the scenery laid out before you when you dock. Arles just wasn’t quite as picturesque when we docked. Once you got into town and see the coliseum, it is more impressive. What was your stay in Paris like? Did you feel like you had enough time there? Jeffrey: We bought the Paris Pass, which gives you admission to tons of museums and attractions, and you can skip the lines. Plus, we got a four-day metro pass, so we could jump on and off as often as we wanted. We wanted to see everything, but we quickly learned that was impossible! The Paris Pass gave us access to what felt like millions of attractions — we found out we didn’t have time to do everything we wanted to do. In fact, on Wednesday, we were so tired after exploring Paris for a few days on our own, we decided to take the Ama-sponsored city trip to Giverny, where Claude Monet’s home is. The ride over was so relaxing. It was a welcome respite from trying to do everything in Paris. And in the town, there were almost no vehicles and just one street — so beautiful and peaceful. Ama Waterways offered several included tours in Paris plus several where you had to pay extra. This was one of the ones that we had to pay extra for, but it was so worth it. After three days in Paris, we just needed a break! What Was One of Your Favorite Parts of Your Paris Extension? Jeffrey: Visiting Versailles — it was just enormous. And so crowded! Once you go into the chateau itself, you pass from room to room, and it’s a constant flow of people. Even with the crowds, though, it’s a must-see — and entrance to Versailles was included in the Paris Pass. Another highlight for us was the dinner we had on the top of the Branly Museum, which was right on the Seine with a great view of the Eiffel Tower. Once the sun went down, everybody in the restaurant rushed outside to get a picture of the tower as it lit up! Do You Think You’ll Return to Paris to See Everything You Couldn’t Fit in This Time? Jeffrey: Yes, we do, though we might try renting a condo for a week or ten days. That way we’d have a place to come home to every night, and we could make some of our own meals. We’d definitely buy the Paris Pass again, though! How did Southern Travel Agency Help You Plan Your Trip? We worked with Jane, and she gave a lot of advice on what to do while there. She took care of all planning and paperwork for us, and she did a great job. When we told her that we wanted to spend extra time in Paris, it was not a problem. While we live in Augusta, we flew out of Atlanta, so we drove to airport. Coming back from Europe, we got in at 9 at night, so Jane booked us a hotel — and the hotel provided 14 days free parking, which meant we got to leave our car there the whole trip. It was excellent. We’ve used Southern Travel before, and we find the team there very personable, and they go out of their way to help you. Itching to plan your own trip to a dream destination? Get in touch with our travel planning experts to make your dreams a reality!